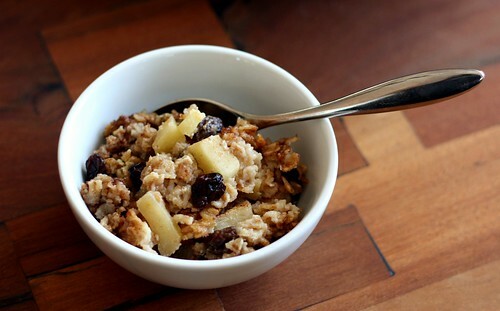 Baked Apple Cinnamon Raisin Oatmeal – Elly Says Opa! For the past 5 or 6 years, I’ve been wanting to love oatmeal. I’ve been trying really, really hard, but I’ve mostly been failing. You see, that was around the time I first committed to eating healthy and losing weight, and everyone who ate healthy was eating oats for breakfast. And I don’t mean the packets with the brown sugar and the maple. I mean 1/2 cup of oats cooked in water and with some cinnamon. I learned quickly that this was not my thing. After some playing around, I realized that I did not like the standard oats to liquid ratio, so I started using less liquid to make it less runny and, therefore, less mushy and unappealing. That worked. I also decided to start adding more spices, and raisins, too. Also a winner. But my pièce de résistance came when I added a little maple syrup. At this point I was starting to like oatmeal well enough, but I didn’t love it. It became my fallback breakfast when nothing else was around. Still, I persevered. 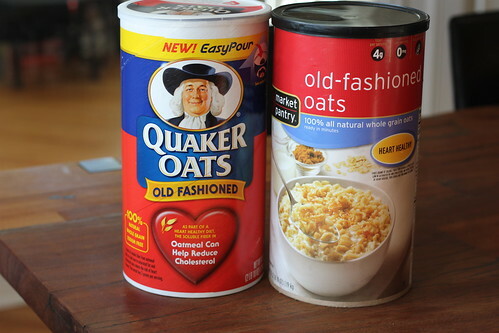 After Zachary was born, I had a bowl of oatmeal nearly every single weekday morning for months, because I was nursing and oats are supposed to help your supply. Eating a bowl of oatmeal seemed like a healthier option than eating a dozen oatmeal raisin cookies, even if that’s what I would much rather have done. One of the biggest issues I’ve had with oatmeal is the texture. 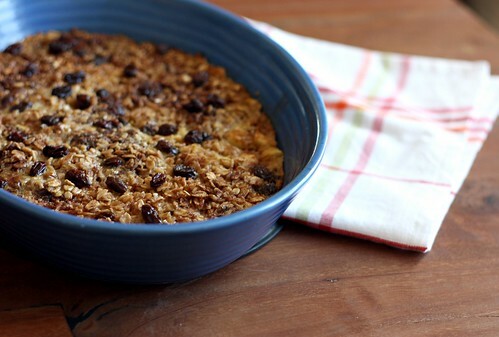 I’d improved it, definitely, but I always wanted to try a baked oatmeal because it seemed it would be more palatable. After seeing this recipe pop up on three blogs I love, I knew I had to try it. Plus, for some reason I have 4 lbs. (yes, 4 lbs.) of oats at home that have just been sitting in my cupboard, taking up space where better things like nuts, coffee, and chocolate could be. Ultimately, I used Tara’s recipe as the base. It was similar to the flavors I’d already used in my oatmeal, and of course I love apples. I always enjoyed adding chopped apples to my oatmeal, too, but rarely did because a whole apple was too much. This recipe really could not be easier. It takes 5 minutes to throw together, max. I mixed everything in a measuring cup (which I used to melt the butter in the beginning, too) so cleanup was easy (not to mention the mixture was easier to pour over the oats). Although it takes about 35 minutes to bake, if you make it on a Sunday, you can have some quick breakfasts early in the week by reheating the leftovers. When I reheated this on subsequent mornings, I added just a splash or two of milk before popping it in the microwave, which worked perfectly. I was SO happy with how this recipe turned out. I can’t wait to make many more versions of this with seasonal fruits! Preheat oven to 375 degrees. Grease a 2-quart casserole dish with butter or cooking spray. In a medium bowl, toss together the oats, spices, salt, and baking powder. In a separate bowl (or in a large measuring cup), whisk together the maple syrup, milk, egg, melted butter, and vanilla. Spread the diced apples in a single layer in the bottom of the prepared casserole dish, and top with about two-thirds of the raisins. Cover the fruit with the oat mixture. Drizzle the milk mixture over the oats, distributing as evenly as possible. Sprinkle the remaining raisins over the top of the oats. Bake the oatmeal for 30-40 minutes, until the top is golden brown and the oats have set. Remove the oatmeal from the oven and serve hot with additional maple syrup, if desired. *I did not measure my maple syrup because I could tell I didn’t have enough. I probably used about 2 Tbsp. and the sweetness was fine for me. If you decrease the amount of syrup, you may want to add just a few extra splashes of milk.